Okay, I was going to post this craft on Tot Tuesday. The only problem? My kids couldn’t help with this baby at all. I actually found this craft a bit challenging, and didn’t want to mislead anyone into thinking it was easy peasy and kid friendly. The after results are awesome, and your kids are sure to get a kick out of it, but you might want to do a run-through of this friendly witch on your lonesome before you get the kids involved. With that said, this witch is SO fun! The kids love her and I do too. :: I recommend using craft glue to glue your cone together. The tape showed too much on my first draft and just didn’t look nice. The glued version looks much better. :: They suggest this: “If you prefer that the back of the witch be a bit neater, after creating your black cone, create a cone from green paper the same size. Cut the face and belt section from the green cone and slide down onto the black cone just as you did with the hat.” DO THIS. This is a much simpler & neater way to get the look you want. :: Like I mentioned above, I highly suggest you do a run through of this craft before you decide to let your kids do it. Otherwise you might all end up getting frustrated. Maybe you should even pre-make the cones for them. 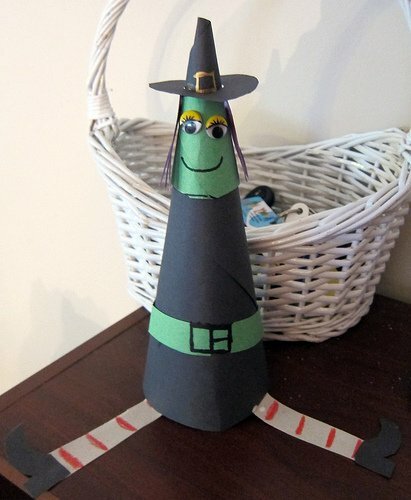 This witch is super fun and a great addition to your Halloween Decor! Be sure to pin this super fun activity to do later and to show off to your followers on Pinterest! Yes it is! I did have fun making this little lady by myself !